I have known for years what to eat and what not to eat. Doing it is different. But yesterday I watched a video that involved children. My eyes teared up. Kids, my kids, your kids ~ it is heartbreaking what we as parents see in the grocery store aisle and buy. We buy it because its labeled as "natural" or "no sugar added" or "whole grain"...all catch phrases to imply healthy. However if you turn over to the ingredient section you will not be able to pronounce half of it. And in my opinion if I can't pronounce something I better look into eating it. I may be fixated, in a cult, or whatever you want to call it. But, one thing is for sure I am going to research and educate myself on something that could affect my children. I have no more time or money then the next person. And when it comes to eating I think that's most of our excuses. Organic pasta, organic pasta sauce, organic frozen green beans and corn, and fresh made meatballs cost $15 to feed our family of 5. My husband took leftovers to work today and I will feed the kids with it again tonight. If we would have went to Pizza Hut it would have cost at least $30. Its math. I am not perfect and we will probably eat at Pizza Hut in the future. The kids have Book It coupons to redeem. What I am is aware. I am open minded. I am learning. Watch the video and start doing your own research. Don't laugh. 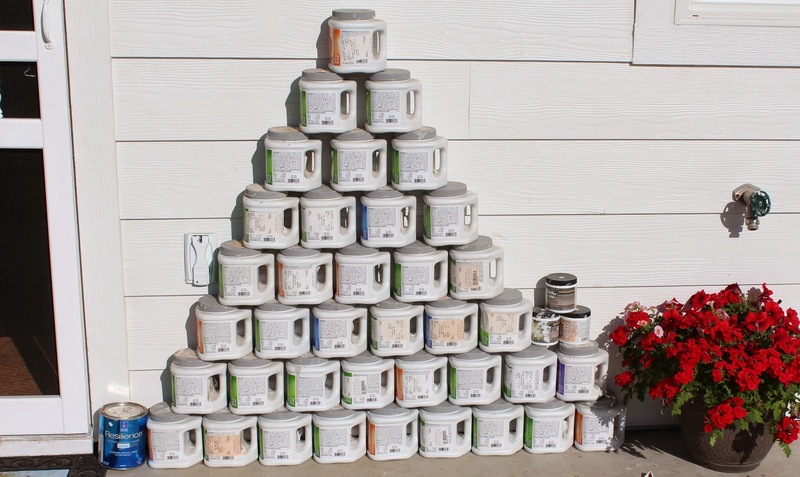 Yes I purchased over 40 samples of paint while we were building the house. And yes, this is all for the interior. If you have followed along you know that I had a tough time deciding on the white. ~the white that all the doors, trim, and kitchen cabinets would be painted~ It was tough. And you know that I did not like the white I chose at first. I still would label it as off-white not white. However, it is working. As we live in our house it has grown on me and I am now really happy with it. Also, if you were to visit (more inside pics coming soon) you would probably be shocked with the color of the walls. They are very light and almost white. The wall colors of each room are anything but colorful. So why would I buy so many samples? Well, because I knew in my head what I wanted it to look like and, as I have learned, I have a hard time pulling the pictures out of my head and into real life. I think some of it has to do with me being so critical and specific. Lesson: if you have a Pinterest board or pictures from a magazine just show the painter and let them recommend a few options...few, as in less than 40. Note: all were purchased during a SW sale...not at full price...in case that justifies the purchases. And I made new friends over at the local Sherwin Williams store. They know me.